Swecha has put up a stall at the ongoing Vijayawada Book Fair being organized at PWD Grounds in Vijayawada. The book fair was inaugurated on the 1st of January, 2015 and the stall received a reverberating response. 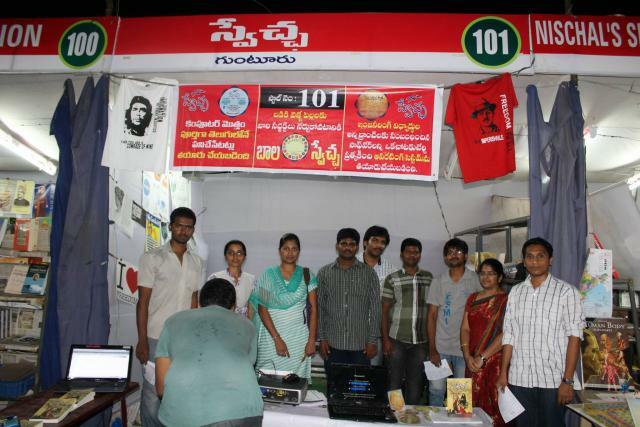 All the visitors to the stall commended the work done by Swecha in bringing out 'Swecha OS' in telugu. Apart from Swecha OS, e-Swecha and Bala Swecha would also be displayed and put up for sale of T-shirts and stickers. Swecha humbly appeals to all of its well wishers and supporters to ensure that the information about the book fair and the Swecha stall reaches as many people as possible. Come. Be a part of the fight for freedom in computing!